graduated from Wake Forest University in 1990, and NCSU-CVM in 1994. She initially practiced veterinary medicine in Forsyth and Davie counties for 10 years before opening the Animal Hospital of East Davie. While in Forsyth County, she also worked for Forsyth Animal Control as a consultant, sat on the board, served on the Advisory Panel that created new laws for animal abuse and trained officers in humane euthanasia. Since 2004, she has served six years on the Davie Humane Society board, and currently is an advisor to the Davie County Animal Control and trains their officers to perform humane euthanasia. 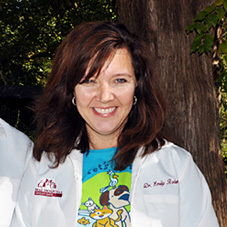 Her favorite interests in veterinary medicine include soft tissue surgery and canine reproduction. She lives in Davie county, is married and has two sons, two mini-Australian shepherds, one DSH Orange Tabby and one goldfish. completed her undergraduate study at Dartmouth College and graduated from the University of Pennsylvania School of Veterinary Medicine in 1998. She has practiced small animal medicine in New Jersey, Pennsylvania and Ohio, before moving to Clemmons, NC, where her husband is a football coach for Wake Forest University. Dr. Scheier enjoys internal medicine, especially feline endocrinology, as well as general surgery. She lives with her husband, four children, and 14 pets, including three dogs, five cats, a bearded dragon, a chameleon, a cockateil, a chinchilla, a hedgehog and, Kramer, the talking Cockatoo.